For a coffee and beer event they were hosting late in 2018, 3 Ravens head brewer Brendan O'Sullivan created a coffee and blueberry sour. Clearly, he was enamoured with the outcome as he's returned to that combo for the second release in the brewery's Shake series of milkshake IPAs. It doesn't take long to see why, with the coffee – a natural process Honduran Pacas varietal roasted by his favourite local roaster, Proud Mary – and fruit intertwined on the nose to such an extent it's hard to know where, like the sunbeams and starlights in Fight Test, one ends and the other begins. 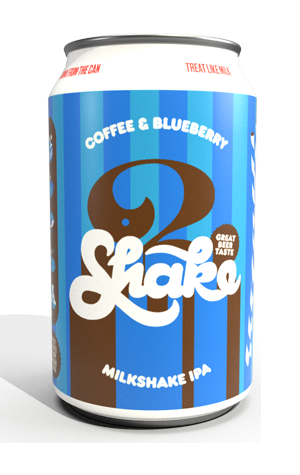 All manner of other ingredients, including oats, lactose and vanilla add to the creamy sweet milkshake side of things, while Bramling Cross and Mosaic hops bolster the berry qualities. You'll pick up some chocolate and caramel in there too, yet it's not as intensely dense and rich as its forebear, Salted Caramel, and thus a beer you're more likely to return to once the novelty wears off.